The man pictured to the left lives near Austin, Texas and what he does is hides boxes in the woods, filled with gaming goodies. In particular he hides real life Mario coin boxes and Zelda treasure chests. Inside he includes some of his fan artwork and various other fan creations including beaded artwork. 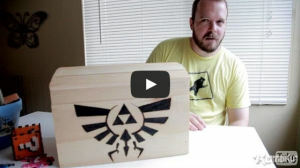 The latest box he is working on is massive and has a large Zelda emblem on it, along with some Zelda art. This is probably one of the most unique ideas I’ve ever seen. Go ahead and make the jump to check out the video first hand.